Okay, tis the season I know. It seems every year someone has to trot out the trite and inane message. Businesses put it on their signs along with Churches. News Opinion commentators advance the perspective as though they thought of this clever turn of phrase themselves and are the only ones for hundreds of years to have recognized this incredible travesty. First of all, to whom is this addressed? If it’s a public message on the sign of a small business, a church sign or a on a Main Stream Media Opinion site, just who are they talking to? If they’re talking to me, as a secularist and atheist, what do I care? Christmas isn’t MY holiday, I don’t celebrate Christmas, so the message is meaningless to me. How could I put Christ back in Christmas, why would I want to, why would I care? If there is a problem with the way Christmas is being celebrated talk to the people whose holiday it is, Christians! After all Christmas is a Christian holiday! Why would you admonish non-Christians to put Christ back in Christmas? Second, whose fault is it anyway? Christmas is a Roman Catholic Holy Day. The Roman Catholic Church put the celebration of Christ’s Mass on December 25 because it was already a festival day, a PAGAN festival day. The Archbishop of Cantebury has finally come out and acknowldeged this apparently little known fact. It was the time of the Winter Solstice. Converts were used to celebrating on that day so the Church commandeered the day to make the transition for them easier and so there would not be as much competition. So, from the get-go non-Christian elements that had absolutely NOTHING to do with the “reason for the season” were incorporated BY THE CHURCH, into the celebration for it’s own reasons and “reinterpreted” to make them more palatable and “compatible” with the new “holi-day”. As the years went by more and more traditions were incorporated and celebrated by the faithful, the Christians, you know, the ones who are complaining now. The Church encouraged this to keep hold of people. 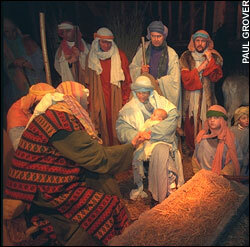 Christians then championed the codification of Christmas into society. Christians encouraged the incorporation of Christian practises and morals into the secular structure of society in an attempt to have a sort of theocracy or a Christian Nation rather than retaining the secular nature of society and keeping religion along with it’s rituals and Holy Days in the Church. This almost guarantees that as the society becomes more secular the practises would also be secularized. What is going to happen if you have a celebration sanctioned and recognized by government and broadly encouraged in society when the society becomes secular? The celebration will also become secular. Take about casting pearls before swine so to speak! If Christians had kept the Holy Day to themselves rather than foist it on society weaving it into the life of the community this would not have happened. By the way whatever happened to the Reformation? I mean the Protestants sought to break from the Roman Church and it’s traditions, well, kind of when it came to the Lutherans and others. They sort of kept one foot in the door, same with the Anglicans, the Catholic Church by any other name. However, what of the Calvinists and the Baptists? They sought to distance themselves from all of the papist nonesense. What of their decendents the Presbyterians and Baptists of today? You would think they would be the first to let society have Christmas and deny all that popish business. No, they have jumped on the bandwagon and promoted and maintained the whole Christmas “spirit”. I have an alternative admonition! 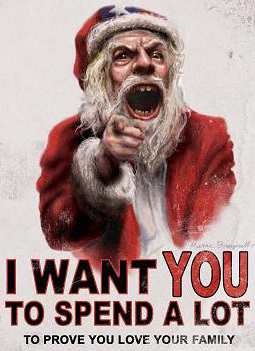 How about “Put the MASS back in ChristMASS?!! Hmmm, not too keen on that are you? If Christians want to put the Christ back in Christmas I’d say they need to talk to the faithful. Get the true believers to mend their ways. Get the faithful to clean up the celebration of Christmas. Let society have Santa Clause and ornaments and Christmas trees and all that stuff. Filter out all the misunderstanding, misinterpretation and mythologizing of the Christmas story as the Archbishop points out. Most of what you see in the “Manger” is speculation or outright fabrication even from an “historical” perspectives as taken from the original documents. So, don’t admonish me to put Christ back in Christmas, talk to your own people. Own up to your responsibility for the mess you are decrying and bemoaning. Why get upset when the celebration begins to move back to it’s ORIGINAL meaning with Winter Solstices and other Pagan practises which eliminate Christ from the season. The real “reason for the season” is the Solstice if you really have to know. Why not just abandon “Christmas” as a holiday. Let secular society celebrate it as they will. Revamp it to be more religious, more specifically Christian. Remove all the pagan elements, remove the commercialism, Santa Claus (Saint Nicholaus, oh pleeese, this is a real stretch. Santa Claus is no more Christain and the Easter Bunny). If you are willing to “accomodate” for your own comfort, to be able to “participate” with the secular society you dispise, then just admit it. If you don’t want to give up the pagan elements of Christmas, just accept it and don’t trot out that worn and threadbare admonition “Put Christ back in Christmas”, or it’s close relative “Rememeber, Jesus is the reason for the season”, GAG! BARF! P.S. Apparently the date for Christmas was set by the Council of Nicaea in around 325. The council was called by Constantine, Emperor of the Holy Roman Empire, the one who converted to Christianity and then legitimized it as a “legal” religion. This was not the main reason for the council but apparently was done. It was set on that day because it fell between two pagan festivals one of which was Saturnalia in which the birth of the Sun God Mithra was celebrated. It gave the newly converted Christians a festival during the pagan festival time. It was inevitable they would incorporate some of their traditions into the Christian celebration. P.S.S. This just in, Mike Huckabee refuses to apologize for Christian Christmas message. Personally I don’t see why he should but then it’s a clear example of the confused thinking I mention here in the post. Ironically the “cross” in the background in this Christian message was “unintentional”; it was only a bookcase, but the Christmas tree in the forground was entirely intentional. So, the clear, unambiguous Christian symbol was unintentional and not meant to be there at all and the pagan symbol WAS intentional. Amazing!